Baretti was founded in 1890 by my grandfather Giovanni Baretti. 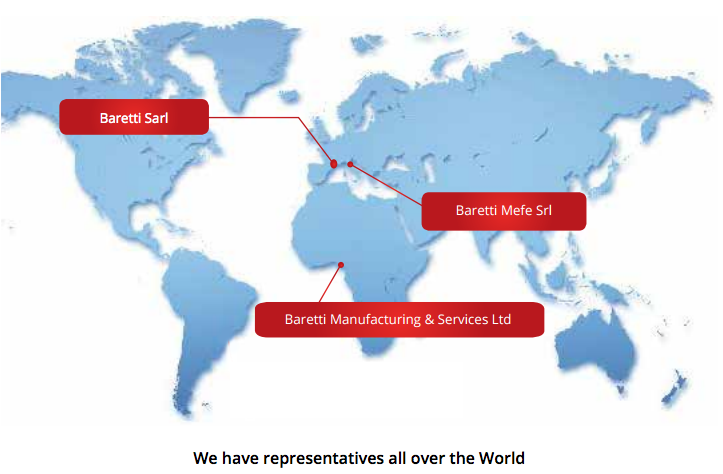 Since than, Baretti has seen several transformations and gone through evolutions. Between all, I would like to mention the most vital and successful ones. During the 50s, inspired by Mr.Enrico Mattei, the President of ENI, we entered into the business of the equipment for the newly growing hydrocarbon industry world- wide. We added the construction and installation of Marine Loading Arms and special facilities for the berthing of oil super tankers. In the 80s, we started to design and construct special high-precision mechanical manufacturing machines. Even, we manufactured components for nuclear plants, as per that period, most advanced certified quality management system. Today, our business is focused upon technologies for the hydrocarbon processing industry and separation components. What we have learned and experienced in the course of the past 125 years still permeates the company. We learned the importance of our Customers and earned their respect. We value the importance of passionate Employees. We still have the same enthusiastic entrepreneurial spirit, which took me to USA almost 50 years back to acquire licenses for new technologies creating new opportunities. We daily strive for innovative technologies, products and applications. Nowadays, our products are present in almost every country having hydrocarbon processing industries but still every day we follow few basic but very important principles. Be humble, act in good faith, struggle for Quality,meet Customer Satisfaction, Practice Safety. Every day we are working for a better future where we see Baretti growing into a more profitable company and expand its reach in every corner of the world with the wish of adding value to our Customers and Civil-Society while keeping in harmony with the global environment.